I am writing this blog on the eve of what many people believe will be the last year of human history. 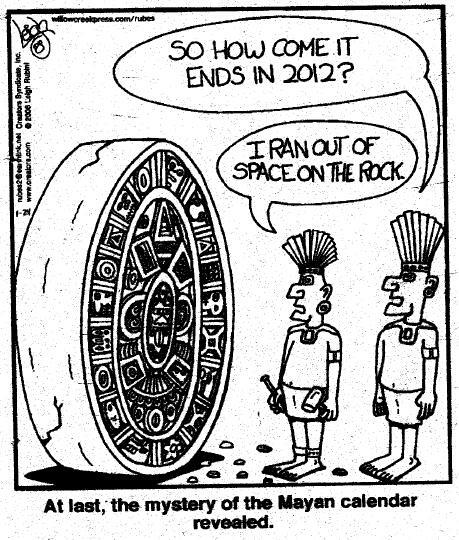 The reason they think that this is the last New Year's Eve is because on December 21, 2012, the Mayan calendar ends. What they fail to recognize is that on December 22, 2012, the Mayan Calendar begins. This is because, like most societies of antiquity, the Mayans did not view time as linear, they viewed it as cyclical. It is only after the development of Apocalyptic Christianity (and thank you, Saint John the Divine) that time began to be viewed as linear. Even the Old Testament has cyclical themes, where similar events happen over and over. The cyclical time view is a very natural cognitive progression: day turns into night, which then becomes day again; the moon waxes and wanes over and over; summer follows spring, which turns to fall then winter, then back to spring. Cycles exist everywhere you turn in the natural world, even on the grandest scale. The Big Bang may very well end in the Big Crunch if the universe actually has enough mass to reverse the expansion. The linear view of time is the cultural anomaly, yet we constantly project a linear view onto the world, even on cultures that do not share that concept. The Mayans, like most Meso-American cultures, viewed time as cyclical, which can be proven by the simple fact that they made their calendar round. A circle has no beginning and no end; when you return to the place you started, a new revolution begins. I would like to note that the linear view of time is probably an outgrowth of the linear nature of the human life, mixed with a belief in heaven and hell. Most cyclical time cultures also believe in some form of reincarnation or rebirth, where this life is one of many. The Abrahamic Traditions view this life as having an end, and after it ends, we go to an eternal afterlife. This raises an uncomfortable theological question, if the Universe does end in a Big Crunch do Heaven and Hell also crunch? Also, if the universe ends in entropy, where it turns black and cold and all energy ceases, does heaven also go dark and God fall apart like everything else? At its root, though, the belief in the end of the world is a very narcissistic world view where people can't bear the thought of life continuing without them. Many people find comfort in the idea that when they die, so does everyone else. Its sort of like, when you leave the party, you want them to kick every else out with you, lock the door and turn off the lights. I have actually talked to people who believe in the Dispensationalist view of the Bible who hope the Rapture happens in their lifetime, so that everyone they love will ascend into Heaven with them. This is an idea that I find appallingly self centered. To return to my original point, we are projecting a liner view onto a cyclical calendar. The ancient Mayans would be shocked to hear us say that they predicted the end of the world, they just viewed it as the end of one cycle and the start of another cycle. To them, this would just be the end of the thirteenth b'ak'tun and the start of the fourteenth. The Mayans even developed a complex "horoscope" of the K'atuns (the 7200 day period of the shorter cycle), describing the general character of the cycle. The k'atun that begins next December is one of transition and change, which further reinforces the idea of the restart after the change of b'ak'tun. This is not to say that the world won't possibly end on December 21st, but if it does, it will be from something much more frightening than a 500 year old Mayan Calender. It will be because people believe so fiercely in the end of the world that they actually bring it about. When Harold Stroke predicted the end of the world last May, thousands of people got rid of everything they owned, quit their jobs, and otherwise divested themselves of everything in preparation of the Rapture. In the year 1001, there was mass famine in Europe because people didn't plant crops because they believed that Jesus would come at the end of the Millennium and the world would end. People want to believe so strongly in the end of days that they will give up everything that they have to prepare for it. They believe so strongly that some will actually even try to bring it about. There have been some hints leaked to the press that the Dispensationalist world view was part of the idea behind the Iraq War, and that the Bush White House was trying to set the stage for the Rapture to occur. I do not know if these are valid, and I certainly do not wish to fuel any conspiracy theories. However, it does fit with things that I have heard evangelical ministers on TV preach about the Middle Eastern Wars. It could just as easily be that the preachers were creating a Christian mask to enframe the wars as God's will. In either case, it will only take a few nut jobs who want to bring about the end of the world to actually start something that spirals out of control and does do some significant damage. White supremacists could try to start a second Civil War if Obama get's re-elected. The debt crisis in Europe could spark a new European World War. Iran could lob a nuclear bomb at Israel. Kim Jong Un could do the same with South Korea or Japan. The possibilities are endless; and there are many things happening that could bring the world to it's collective knees. There is only one thing that is certain; if the worst does happen this year, it will be completely explicable by human behavior. It will not be because a Meso-American culture five hundred years ago ended a calendar cycle on December 21, 2012.